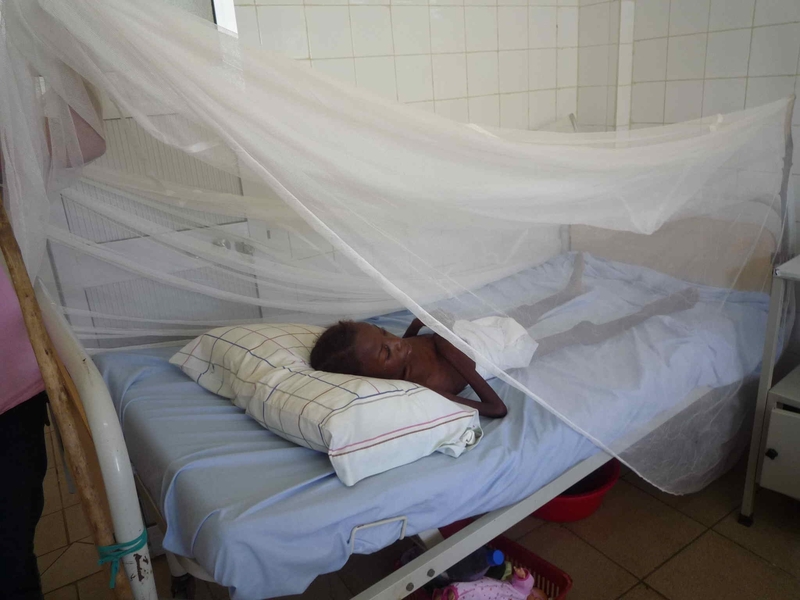 The Angola Mosquito Nets Project has been operational since 2000 and has raised approximately $175,000 from individual donors in Angola and overseas and from Angola-based oil companies and oil service companies. The funds are used to buy mosquito nets and donate them to responsible aid/humanitarian organizations in Angola who then distribute them to Angolans in areas, mainly in the provinces, where there is a great need for mosquito nets. To date, we have purchased and distributed about 25,000 nets from the funds raised. This project is operated by volunteers, both expatriate and Angolan, and there are no administration or overhead costs involved. We buy high quality, insecticide impregnated mosquito nets from a supplier in Luanda (CICCI Angola) at $7.50 per net. Since we have no administration or overhead costs, all funds raised are dedicated to buying nets. For example, if we received a donation of $750, we buy 100 nets with it and the donor is assured that the nets will be distributed to Angolans needing nets. On Thursday, September 16 (10:00 AM) we will be donating 3700 nets to Save the Children, Development Workshop, Luanda TB Hospital, Benguela orphanage and various church organizations including the Baptist Mission. The location is the CICCI office, Rua Fernado Mendes Pinto 38-40, Alvalade, Luanda. Organizations which donated funds for these nets in the September 16 handover include Chevron, Tullow Oil, Statoil, Fugro, the Viking Club of Luanda, the International School of Luanda, families in Ireland, Norway and Canada and churches in the United Kingdom and Luanda. In previous years, this project has also donated nets to organizations including Oxfam, UNICEF, Norwegian Refugee Council, Medair, Concern and church organizations. DOWNLOAD PHOTOS FROM THE TRANSFER HERE. DOWNLOAD LIST OF ORGANIZATIONS & AMOUNTS HERE. DOWNLOAD THE PRESS RELEASE IN ENGLISH HERE. DOWNLOAD THE PRESS RELEASE IN PORTUGUESE HERE. Happy to be receiving a mosquito net. Mobile Clinic Volunteer Viveca Chan, a nurse and their young patient. 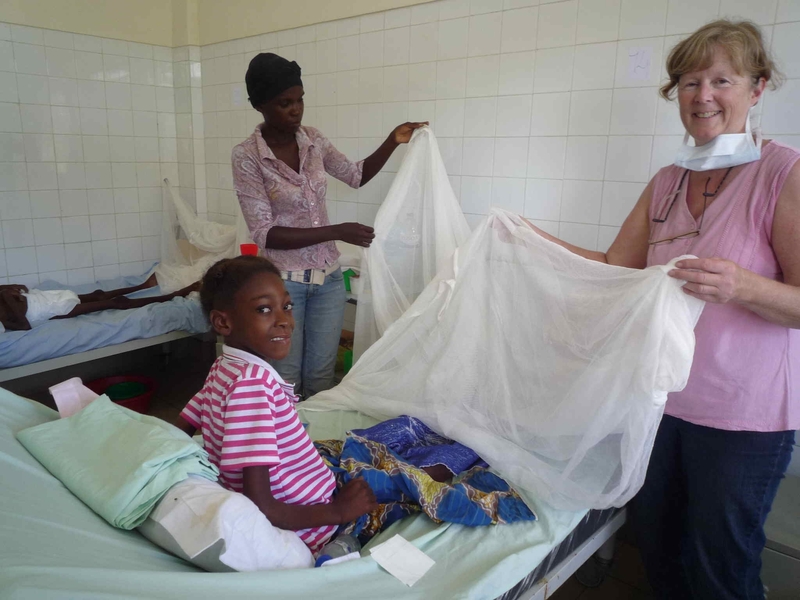 The Angola Mosquitonet Project donated 700 nets in January to the Mobile Clinic, a small team of women who work with some of the 350 patients at the Tuberculosis Hospital in Luanda. Headed up by Bernie Nicholson, a registered nurse who formed the group six years ago, the women get donations to buy food and medicine and other necessities such as drinking water for some of the patients there whose families cannot afford to support them. All tucked in and protected from mosquitoes. 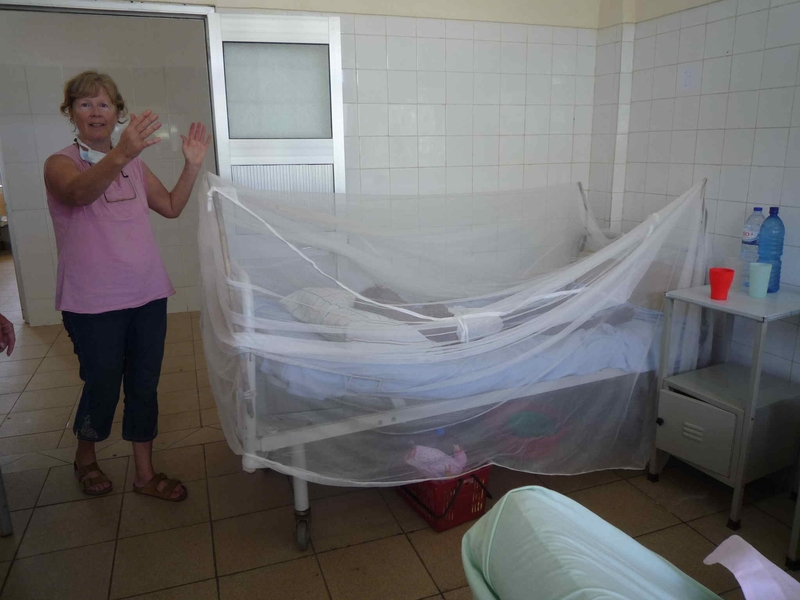 Mounting a net on a hospital bed is a challenge. Without leave to drill holes in walls or the ceiling, sticks are tied to bed posts and the net is tied to the sticks. The Mosquitonet Project is happy to support the Mobile Clinic and thanks them for helping TB patients. Why the grim malaria stats for children? Doctor diagnosing a child with malaria in Cunene province, Angola. We know mosquito nets are important for young children because they are more vulnerable to malaria, but why? According to the Angola Malaria Indicator Survey*, for about six months following birth, antibodies acquired from the mother during pregnancy protect children born in areas of endemic malaria. This immunity is gradually lost, and children start to develop their own immunity to malaria. The pace at which immunity is developed depends on their exposure to malaria infection. In areas where malaria is endemic and transmission is intense, children are thought to achieve a high level of immunity by their fifth birthday. Before then, young children may experience repeated episodes of malaria, some of them life-threatening such as cerebral malaria. This contributes to high childhood mortality rates in a number of countries. In areas of low malaria transmission, immunity is acquired more slowly. In 2004 Angola reported 3.2 million cases of malaria, two-thirds of them in children under 5 years of age. It is estimated that malaria accounts for 35% of overall mortality in children under five and 60% of hospital admissions of children under five. *The 2006-07 Angola Malaria Indicator Survey (AMIS) is the first survey in Angola to collect nationally representative data on malaria-specific indicators. 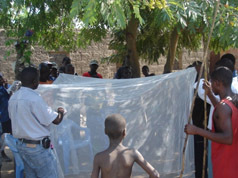 For more information about malaria and the Angola Mosquito Net Project, click here to download our latest update. Welcome to the Angola MosquitoNet Project Blog. Malaria, a preventable and treatable disease, is the leading cause of death in Angola and all of Africa. And mosquito nets are the the first line of defense. The Angola Mosquito Net Project has raised over $90,000 since 2000 from individuals, groups and corporations in Angola and overseas. By the end of 2008, we want to reach the $100, 000 mark, which is 12, 000 family size nets. We appreciate your support!